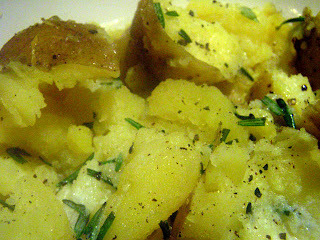 French fried, baked, boiled, grilled, mashed and stuffed; the potato is a most versitile side dish. 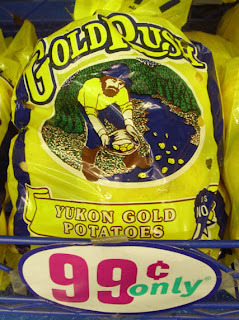 The 99c only Stores are selling 5 pound bags of Yukon Gold potatoes for 99 cents. Similar to the red potato in texture and size, the Yukon Gold is less waxy and more creamy. The Chef has a simple recipe you can stake your claim on. Boil potatoes until soft; about a half hour to 45 minutes. Potatoes are done when a fork easily pierces the flesh. Drain and break potatoes into large pieces; leaving the skin on. Mix in rosemary or any herb you have. 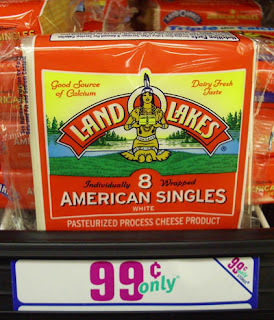 Add a couple slices of butter or drizzle with a tablespoon of olive oil. Salt and pepper to taste. 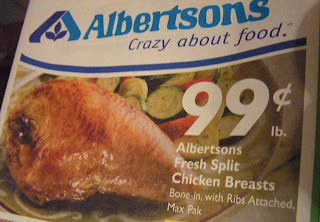 The 99 Cent Chef has not had Cornish Game Hen since I don't know when. 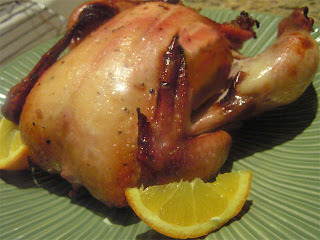 For some reason, I remembered Cornish Hen as having a gamey, strong flavor. Wrong! 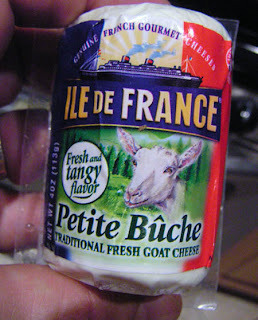 It has the most delicate texture and a light, buttery flavor. 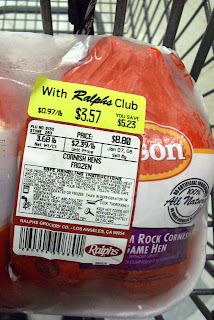 This winter, my local Ralphs and Albertsons markets have had sales on Cornish Game Hens for 97 and 99 cents per pound, respectively; normal price is $2.39 per pound, on a 2 bird package. 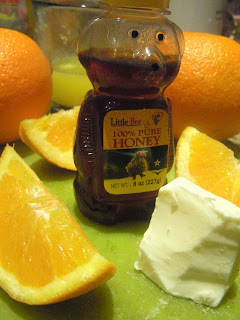 I like to baste the bird with a mixture of melted butter, orange juice and honey. Make your favorite stuffing to complement the bird. It's kind of funny to stuff such a small bird, but the stuffing will be delicious. 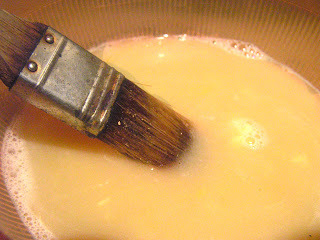 Mix and heat the orange mixture until it thickens; about 3-5 minutes. 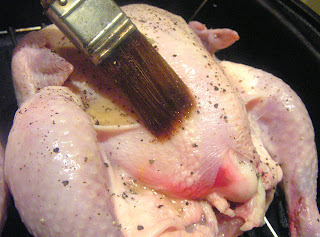 Baste cornish hens 3 or 4 times during baking. Baste the bird; salt & pepper to taste. Bake at 375 degrees for a hour to a hour and a half. I check for doneness by piercing thigh with a fork to see when juices run clear. Cooking takes longer than package directions when you frequently open the oven to baste. The Chef loves Cuban music, Cuban food and especially Cuba's oldest cocktail, the minty Mojito. Like Cuban cigars; Cuban rum is on the American embargo list. Let's end this embargo. The Chef wants access to real Cuban rum! Fidel Castro and Che Guevara's Cuban Revolution is so last century. Hey White House, get over it! 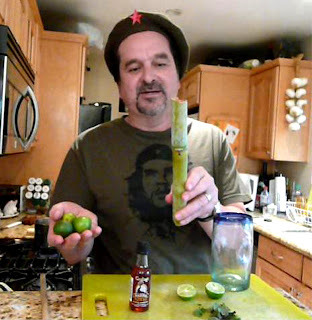 In the following video you will notice The Chef's Mojito is not clear like most; that's because dark rum and fresh-made sugar cane juice is used. Most Mojitos are made using white sugar and clear rum. Using two 12 inch stalks of sugar cane; peel, cut into several pieces and crush (cover pieces with plastic and mash with a hammer.) In 3 cups water, boil crushed sugar cane until 1/2 cup of liquid remains. Let sugar cane juice cool. This makes enough juice for about 4 cocktails. While not as sweet as granulated sugar, homemade cane juice imparts a rich, earthy, lightly sweet flavor. Muddle (crush) mint leaves in bottom of a cocktail glass. 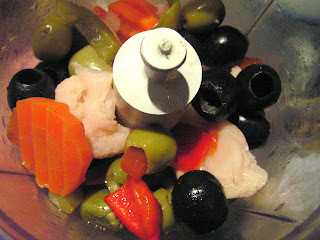 Add rum, sugar cane juice, juice of one lime and sparkling water. Garnish with a lime slice. When substituting cane juice with sugar, add it to mint leaves during muddling. 99 thanks to my neighbor Nuno Pinheira for his camerawork and a taste testing cameo. 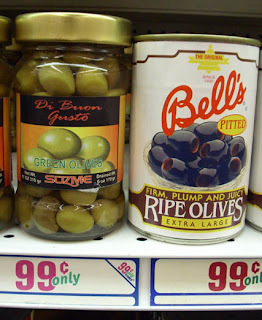 Do you have a favorite quenching cocktail The Chef can turn into a 99 cent creation? It's just a comment away. 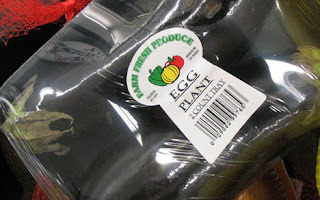 This week chicken breast (whole, bone-in) is on sale at my local grocery store for 99 cents a pound and eggplant is showing up at the 99c only Stores. 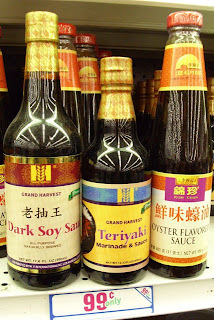 Let's make a stir-fry. Whole chick breast is easy to fillet; a couple of slices down the center bone/cartilage and the white meat separates easily. Chop into bite sized chunks and season with salt and pepper. 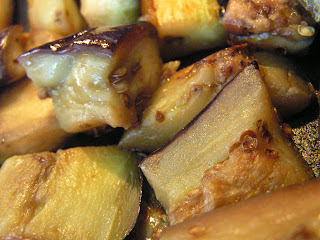 Cut into cubes and stir-fry eggplant over high/medium heat in 2 tablespoons of oil. May seem like a lot of eggplant but it reduces by half. Saute until soft, about 5 - 7 minutes and transfer to a large bowl. 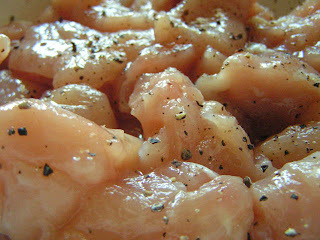 Stir-fry chicken breast in one tablespoon oil until done, about 5-7 minutes. 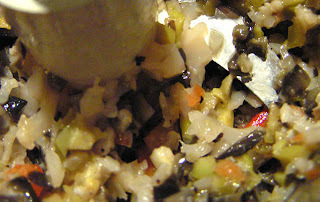 Remove and add to bowl with eggplant. 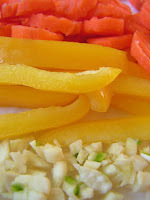 Add any of your favorite veggies; I'll add carrots, bell pepper and chopped garlic. In a teaspoon of oil, stir-fry for about 3 minutes. 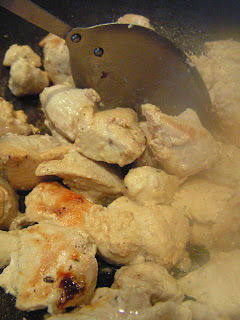 Add cooked chicken breast and eggplant to wok/fry pan. Clear an empty area in middle of wok and pour in Sauce. Stir liquid for a couple of minutes at high heat until it thickens. 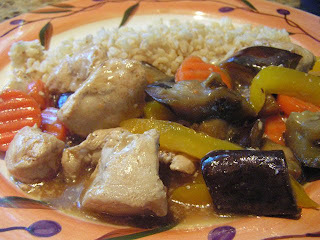 Stir together meat and veggies, heat through; serve with white or brown rice. 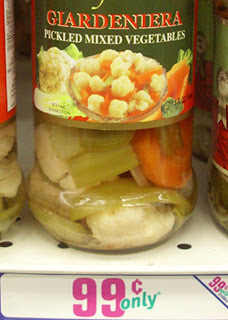 Tonight, Food Network stalwart Bobby Flay will do battle over a Louisana delicacy, the Muffaletta Sandwich. The show is called "Throwdown with Bobby Flay," and basically, he travels state to state challenging the locals to a cookoff. 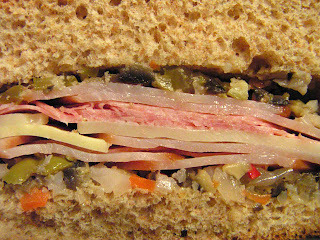 You haven't heard of a Muffaletta Sandwich, right? 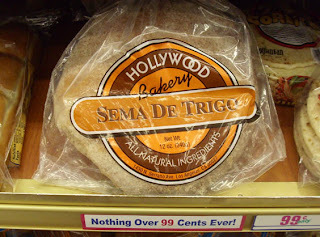 The Muffaletta was invented in 1906 in the French Quarter, at an Italian store called Central Market Grocery by Signor Lupo Salvadore. Central Market is still in operation. Basically an Italian deli sandwich of salami, ham and cheese, dressed with an "olive" salad, instead of mustard / mayo; it's served in an Italian bread round loaf. Po' Boy sandwich kind of guy (it's hard to beat fried oysters on a French roll.) 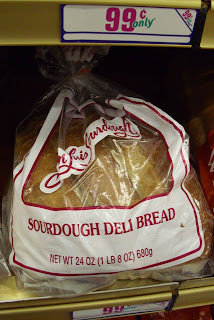 When driving through Louisiana, stop at a small town grocery store and chances are you will find a sandwich counter in the back. Order a Mufalleta and tell them The 99 Cent Chef sent you. chop roughly at lowest speed; or hand chop to a chunky consistency. 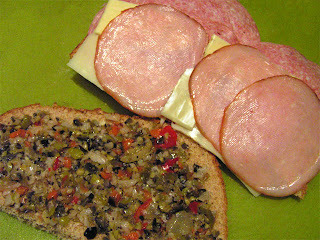 Slice halved loaf and layer olive salad, salami, ham and cheese. The Chef will be watching Bobby Flay on The Food Network tonight. 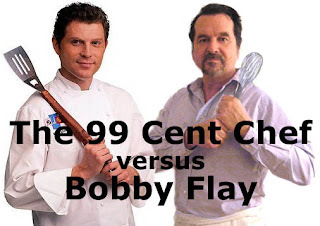 Hey Bobby, next time you're in L.A., The 99 Cent Chef would love to challenge you to a 99c only Store "Throwdown!"